Nut roast isn’t the first thing you might reach for when building your beasty boxing day sandwich. 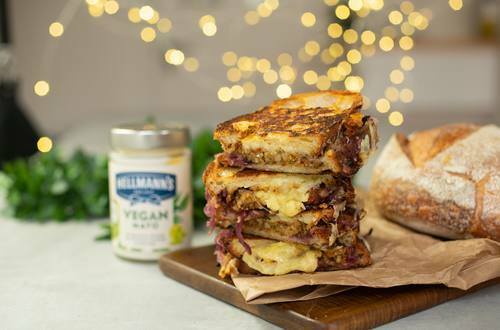 But it should be: this towering toastie is a rich and delicious way to get ready for Veganuary. 1 Set a pan to a low heat and add the oil, onions, garlic, thyme and a pinch of salt and cook until the onions are soft and sticky but not browned. 2 Next add the sugar and vinegar and continue to cook until the onions reach a sticky jam like consistency. Remove from the heat and allow to cool. 3 Spread the vegan mayo on one side of each slice of sourdough. Take one slice and place it mayo side down on a board. Spread on the onion jam, add half of the sliced nut roast and half of the vegan cheese and top with another slice of sourdough, mayo side up. Repeat this process so that you have to sandwiches. 4 Set a frying pan to medium high heat and place the sandwiches in. Cook on both sides until golden brown and melted in the middle.